Four decades of onscreen fun and interaction: This new and heavily updated edition of the classic Gameplan book presents almost every game computer and console ever created, from Japan, USA and Europe, along with classic software in its authentic, pixellated glory, and background information as well as key technical facts. Nearly 500 game machines — million sellers, bizarre slip-ups and exotic variants — are celebrated in full colour chapters with extensive appendixes. From Atari to Xbox, from the C64 to 3DS: Game Machines is the reference point for members of the PlayStation generation; whether they’re gamers or collectors. 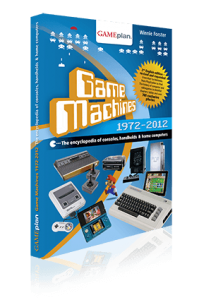 Originally published in Germany, Game Machines has been recognized as a `suitable reference´ and `recommended reading´ (by Germany's premier micro monthly C’t), as `very entertaining´ (Gamestar) and `compulsory reading´ (PlayZone) or simply as `Ace´ (ComputerBILD). Seven years in the making, this greatly enhanced and revised edition invites you to a time journey across the video game era: From the 4-bit beginnings to the broadband future. Honestly? We think it's great (...) it's fantastic. I've seen a lot of books written on the history of gaming, and yours is by far one of the most entertaining and informative. The book is excellent — thanks very much (...) The Spectrum page really brought a tear to my eye. One of my all time favourite books: Everyone who plays games should buy a copy! Second edition: 248 pages in full colour. From Atari to Sega, from Apple to Nintendo 3DS: The illustrated history of nearly 500 micros, consoles and handhelds, with more than 600 pictures, history & technical data.